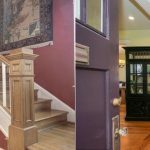 “Patti Francis, an art spirit with a curatorial eye for color, assisted in creating rooms within my 1877 home sweet home that echo the past and embrace the present: a Farrow and Ball Cat’s Paw entry with Tanner’s Brown doors and trim are the perfect welcome home!” –Jo Mc. 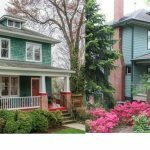 “Working with Patti has been one of the wisest investments we have made in our new home. 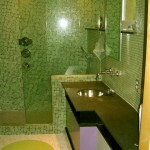 She has provided immense guidance on all of the considerations that go into a color scheme. 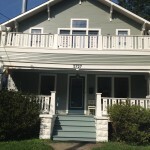 Our home has undergone a beautiful transformation and we truly could not have done this without her. 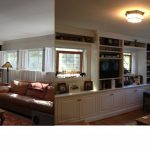 Thanks to Patti the colors we chose convey exactly what we envisioned for our home – a fresh, warm, inviting space filled with light.” Ellie B. 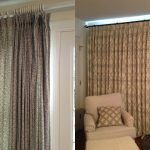 “Patti has helped me with a number of decorating projects, from selecting lighting fixtures, ordering custom drapes for a full wall of windows and arranging for refinishing and installation of hardwood floors for three floors of our house. 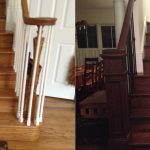 Her design sense is impeccable and she has made every project run smoothly, saving me countless hours researching contractors, searching through options and arranging for work to be done at the house. She is the perfect decorator for the busy professional. ” Mary Q. 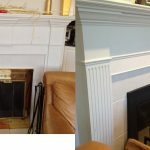 “We were delighted when Patti agreed to help us select paint colors to brighten up several rooms of our home. 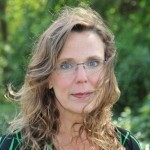 Patti took the time to listen to our objectives, assess the challenges, and make our decisions manageable. 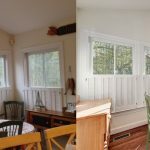 Using her extensive technical knowledge of paint colors and how they work under various lighting conditions, she narrowed the infinite choices down to a manageable few that were consistent with our goals, making it easier for us to move forward. She made insightful and practical suggestions along the way to ease the anxiety associated with making changes to your environment, gave us tips on available resources to validate our selections, and basically provided a guiding and respectful hand all along the way. 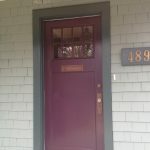 We recommend Patti without reservation to anyone who needs help with any decorating project, large or small.” Pat & Bori C.
Color consultation–choosing a color you love for the front door and making it look fabulous. 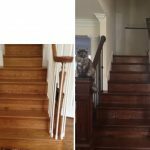 Stairway–update/redesign of staircase–traditional oak floors were refinished to cherry stain, railings and newels were redesigned for an updated look. 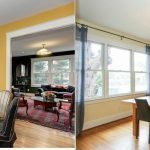 Color consultation–canary yellow and deep green to more subtle and refreshing shades of yellow and green that bring in more natural light and are in keeping with the Craftsman Foursquare period. 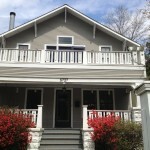 Color consultation–going from dark heavy colors to a more refreshing palette. 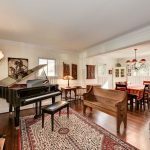 Dining room with silver leaf, painted and burled maple table, mixture of chairs, lighting by artist Rick Singleton, painting by George T. Thurmond. American craft. Venitia Studium lighting. Nagouchi Cloud couch. Sculpture by Jen Townsend. 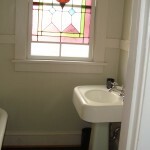 Color Consultation: ready for a change in color? Color Consultation. 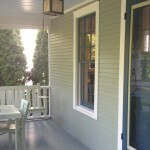 Adding color to the porch as additional living space with painted furniture and color in porch ceiling and floors. 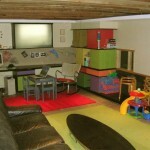 Mid Century Modern: Creating a fun playroom. 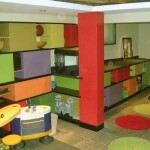 Mid Century Modern: Basement playroom with built in cabinets on angle and mid century modern colors. 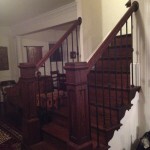 Refinished hardwood flooring–oak to darker cherry stain. 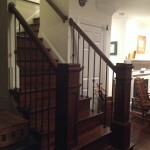 Flooring refinished in cherry color. Moving to a more mission look throughout. 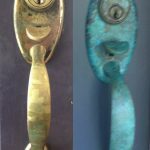 Changing brass door handle to verdigris. 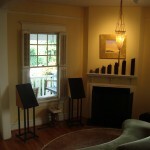 Refinished client’s fireplace to matte black. 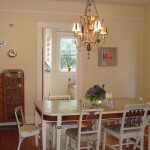 Client wanted to replace brass hanging lamp over breakfast table. Fixture that works with both the Americana look of the breakfast room and the more modern look of the kitchen that opens into the breakfast room. 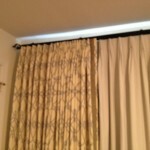 Existing cotton drapes with white wooden rod and rings were replaced with linen drapes with black iron rod, updated pleats and separate lined blackout panels. Separate Linen panels with blackout lining. 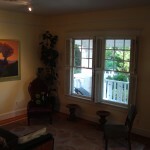 Curtains open to view of river valley. 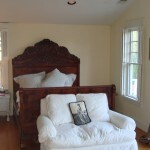 Eames stools, Goetz sofa mixed with antiques. 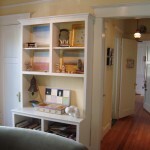 Filling bookshelves with paintings and American craft. 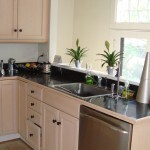 Making the most of a small kitchen. 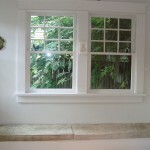 Window seats with toile fabric. 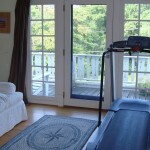 Incorporating workout into everyday life. 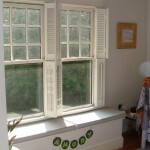 Toy chest/window seat with trim to match trim in home for built-in look. 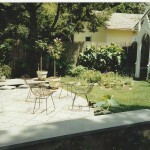 The garden–patio inspired by wonderful pavings from Peru. 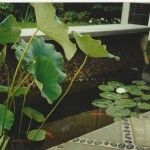 Two rectangular ponds with a rill between them. The quatrefoild design in the gothic arch (creating a rose trellis) with the old Sears kit garage inspired the design of the herb garden. Mid century chairs. 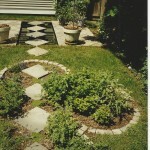 Quatrefoil design herb garden with walkway that runs into the pond–walking on water, anyone? 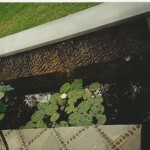 Waterfall runs over the pebbled mosaic wall with a foot rest in the water, where the koi swim against your toes. 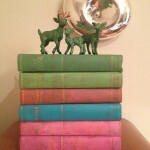 Vintage books in favorite colors. 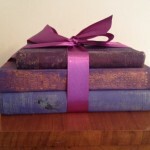 Vintage books–with colors from a favorite painting. The cats were new, too!